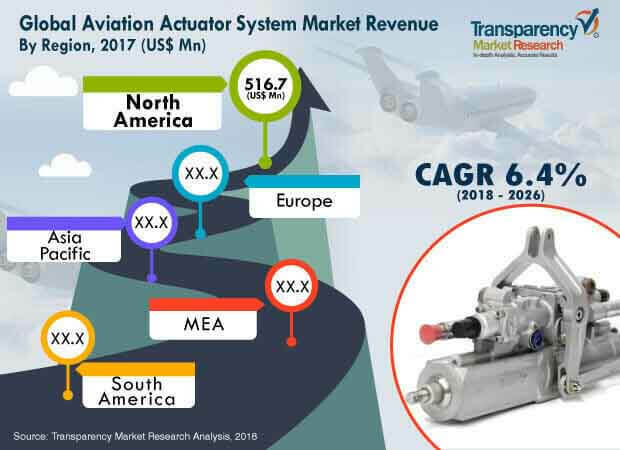 According to a new report on the aviation actuator system market, published by Transparency Market Research, the global aviation actuator system market is expected to reach value of US$ 2283.9 Mn by 2026, expanding at a CAGR of 6.4% from 2018 to 2026. According to the report, the global market is likely to continue to be influenced by a range of macroeconomic and market-specific factors. In terms of demand, Asia Pacific is projected to continue to lead the global market, with the market in the region expanding at a CAGR of 7.3% between 2018 and 2026. The global aviation actuator system market has witnessed strong growth over the last decade. The primary factor driving the market is rising demand for defense aircraft worldwide. In the wake of growing security concerns, increasing military capabilities by countries across the globe, and increasing expenditure on the defense sector, the demand for military aircraft is increasing. Thus, the surging demand for military aircraft is estimated to raise the demand for aviation actuator systems to be used in these aircraft during the forecast period. The shift toward using electric actuators is a major trend being witnessed in the global aviation actuator system market. Some of the leading aircraft manufacturers are shifting toward use of electric actuators instead of hydraulic actuators, due to advanced characteristics of electric actuators. For instance, Lockheed F35, Boeing 787 Dreamliner, and Airbus A380 have replaced hydraulic or pneumatic actuators with electric actuators. The global aviation actuator system market has been broadly segmented in terms of actuator type, application, end-use, and region. Based on actuator type, the market has been segmented into mechanical actuator, hydraulic actuator, electric actuator, and others. The mechanical actuator segment was the dominant segment, holding 34.83% share of the global market, in terms of revenue, in 2017. It is expected to expand at a significant CAGR of 6.7% during the forecast period. This is primarily attributable to high demand for mechanical actuators in the aerospace industry. In terms of application, the global aviation actuator system market has been divided into flight control, auxiliary control, utility actuation, and others. The utility actuation segment is expected to expand at a high CAGR of 7.2% from 2018 to 2026, due to rising consumer inclination toward high-reliability actuators and actuation components used in the aviation industry. Based on end-use, the market can be segregated into commercial aviation and defense. The commercial aviation segment is anticipated to register the maximum CAGR during the forecast period, owing to various initiatives taken for the development of electric aircraft. Among regions, North America is anticipated to hold the maximum share of the global market, while the market in Asia Pacific is anticipated to expand at the maximum CAGR during the forecast period. In 2017, North America accounted for 39.49% share of the global aviation actuator system market. This is attributable to increasing demand from major aircraft companies in the region, which include Bombardier and Boeing. Furthermore, the market in Asia Pacific is anticipated to expand significantly between 2018 and 2026, due to rising disposable income and growing middle-class population across the region. The research study includes profiles of leading companies operating in the global aviation actuator system market. Market players have been profiled in terms of attributes such as company overview, financial overview, business strategies, and recent developments. Some of the prominent players operating in the global aviation actuator system market are Aero Space Controls Corporation, GE Aviation, Honeywell International Inc., ITT INC, Microsemi, MOOG INC., PARKER HENNIFIN CORP, Collins Aerospace, Safran, Sitec Aerospace GmbH, Crissair, Inc., and Woodward Inc. Companies are focusing on expanding their business through strategic acquisitions and partnerships.